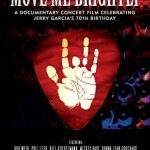 Share the post "DVD review: MOVE ME BRIGHTLY – A Documentary Concert Film Celebrating Jerry Garcia’s 70th Birthday"
‘Move Me Brightly’ is a trimmed version of an original 5 hour web cast of a concert organised by Bob Weir to celebrate what would have been Jerry Garcia’s 70th birthday. The 2 hours and three bonus tracks worth of concert footage and interviews is described as ‘a documentary concert’. In truth it’s a pleasant west coast ‘love in’ featuring random Grateful Dead material, played by Weir and some leading contemporary indie artists and if you are looking for an in depth documentary or the ultimate Dead tribute concert this isn’t it. Producer Justin Kreutzmann (Bill’s son) treads lightly with the gaze of his camera and relies on actor Luke Wilson to interview Garcia’s family members and provide continuity. Bob explains that he went out on the road after agreeing to the concert and it was left to his management to organise most of the supporting cast. The result according to Phish’s Mike Gordon was that it was cool to have 10 or so indie legends on stage. And that is the sticking point really, because well as they all play, the whole evening sometimes resembles a thinly veiled advert for a very loose assemblage of contemporary talent. ‘Move Me Brightly’ is a relaxed trip through The Dead’s back pages with a fluid house band and countless guests who are anchored by Bob Weir in his home studio. There are plenty of talking heads – some relevant and some not so – with Dead members such as Micky Hart, Bill Kreutzmann, Phil Lesh, and the Airplane’s Jack Casady contributing surprisingly little, though Bill does recall the beginning of the Dead and being the first ‘Dead head’. Donna Godchaux (who appears with the house band) also adds her memories of how she and her hubbie Keith originally met Garcia and ended up in the band. Truth be told if it’s an analytical documentary you are looking for this ain’t it, but what we do learn is Jerry was a funny and generous guy, who was a music obsessive and frequently an inspiration to others. The fact that 18 years after his death, a bunch of disparate musician are willing to rehearse 11 hours at a time and be coached by Weir into the way ‘the story is the face of the song’, suggests a deeper connection than you might expect. Neal Casal is particularly moved when both talking about and playing the ‘universal songs we all know and love’; while Bob comments the concert was like ‘a remake of an old movie’. Perhaps the most revealing interview though, is with John Doe who cogently explains how he came from a punk background, but suddenly ‘got’ what JG was all about at a Dead and Dylan concert in Anaheim. Bob further attributes the durability of the Grateful Dead to the fact they kept each other in stitches, and claims he can still feel Jerry’s ‘harmonic sense’ when he’s playing. The many guests are not introduced or credited fully on the box set and vary from the interesting to the frankly redundant. At time there are simply too many musicians on the stand, but the changing ensemble manages to work up a mellow groove on ‘Goin’ Down The Road Feelin’ Bad’. The song features both blues grass player Jim Lauderdale and Jonathan Wilson, who also impresses on a soulful ‘Mission In The Rain’. Presumably it’s Cass McCombs on lead vocals on the meandering ‘Terrapin Station’ with its structural elements of Jethro Tull, but played here without the strings. ‘Shakedown Street’ finds Bob centre stage with Black Crowes keyboard player Adam McDougal who adds funky fills in between Josh Kaufman’s ascending run and Sam Cohen’s fluid playing, while ‘Franklin’s Tower’ captures the band jamming eloquently, with Neal Casal teasing out the kind of uplifting solo that would have made Jerry smile. A special word too, for pedal steel player Jon Graboff who consistently reaches out for Garcia’s signature tone and apart from Weir is the most convincing Garcia apostle in the band. The real debate with Dead heads will be the songs that were left out, after all both ‘Friend Of The Devil’ – which is given a great rendition by Jim Caulderdale – and ‘New Speedway Boogie’ are only there as bonus tracks, while the excellent Lauderdale sung ‘Bird Song’ comes with a great Santana anecdote about tripping with Garcia just before going on stage in Woodstock. This entry was posted in All Posts, DVD REVIEWS and tagged Adam McDougal, Bill Kreutzmann, Bob Dylan, Bob Weir, Carolyn Garcia, Cass McCombs, Donna Godchaux, Grateful Dead, Jack Cassady, Jerry Garcia, Jim Caulderdale, John Doe, Jon Graboff, Jonathan Wilson, Justin Kreutzmann, Luke Wilson, Micky Hart, Mike Gordon, Move Me Brightly, Neal Casal, Phil Lesh. Bookmark the permalink.